100% rabbit hair perfectly blended and available in several colors. Excellent for nymphs and dries. 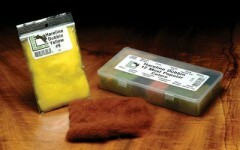 Feathers commonly used for tying soft hackle flies, wing cases, wings and collars.